Project summary: Offshore buoys created for physical oceanographic measurements provide a platform for carbon system measurements, and telemetric capability enables near-real time quality control of the sensor data. A partnership between physical oceanographers from the USF College of Marine Science (CMS) Ocean Circulation Lab (OCL) and researchers from the USGS St. Petersburg Coastal Science Center tapped two pools of knowledge to assemble an oceanographic buoy that monitors key physical and chemical seawater characteristics. The CMS Center for Ocean Technology utilized the CMS Machine Shop to rapidly develop and test a field-ready product. Last month, the newly outfitted buoy journeyed 70 nautical miles offshore aboard the Florida Institute of Oceanography’s (FIO) R/V Weatherbird II to replace an existing buoy due for scheduled maintenance. 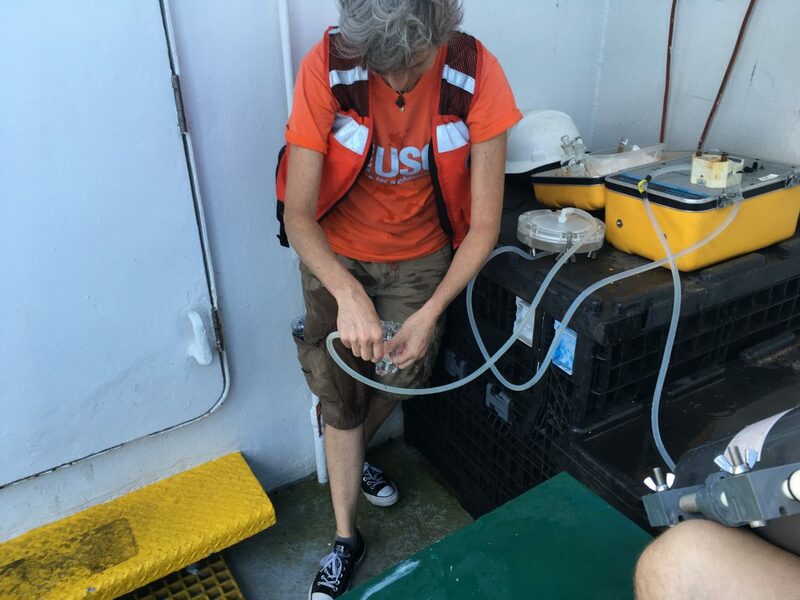 Preliminary feedback through real-time telemetry confirmed successful operation of a suite of instruments that researchers can pair with stations in Tampa Bay to gain a better picture of changes driving ocean acidification, nutrification (eutrophication), and other coastal processes. 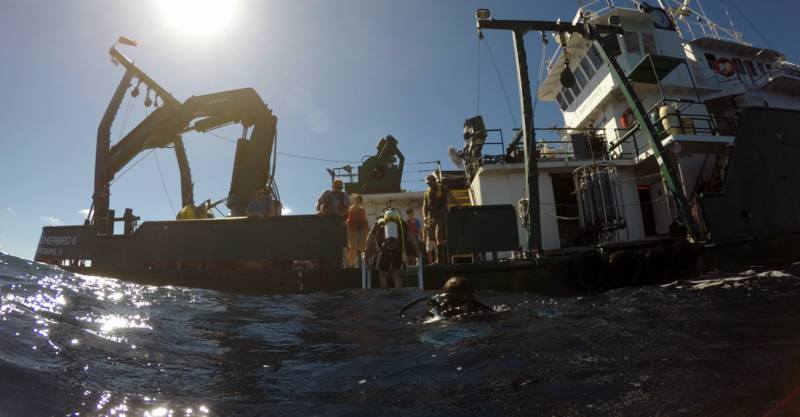 FIO docks in Bayboro Harbor, St. Petersburg, FL – Hard physical work, requiring sharp mental faculties amid rolling seas and unknowns, is just one aspect of field work that oceanographers must prepare for. Years of education and training provide a solid background, but evolving logistics, unforgiving weather, and fatigue must be experienced first-hand – at sea. On the evening of October 24th, 2018, once all of the gear was loaded, instruments were checked, and Captain Brendon “Boomer” Baumeister had gone over safety and cruise protocols with the science party, the Weatherbird II left port just a bit ahead of schedule, around 8 p.m. At a cruising speed of about 10 knots, every bit of that time was needed to make the overnight journey to the buoy site in order to begin work at sunrise. The Weatherbird sailed out of Tampa Bay under clear skies and calm seas. 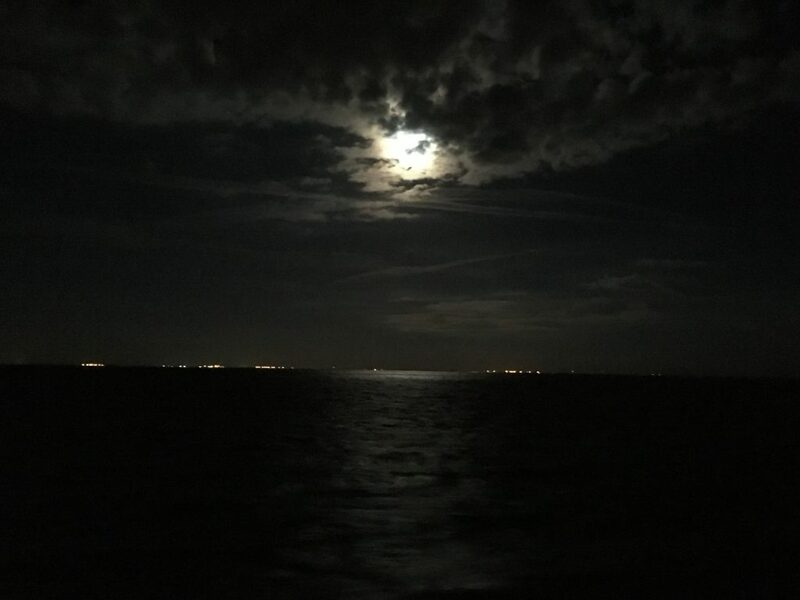 In between scheduled tasks, the volunteers and some of the science party enjoyed a bit of star-gazing, snapping photos of the full moon and the reflection of light it shot across the surface of a black, nighttime sea. Out past the Skyway and underway to the offshore buoy site, a little free time gave everyone a chance to enjoy a bit of ice cream, a much needed sugar-rush before beginning the main preparations for the next morning. A full moon reflects across the waters of the Gulf of Mexico as the R/V Weatherbird II leaves Tampa Bay, FL. The USGS science party, comprised of Dr. Kimberly Yates (research oceanographer) and technicians Chris Moore and Mitch Lemon, checked the instrumentation fastened underneath the buoy that would provide measurements of key chemical components of the marine carbon system: pH, pCO2, dissolved oxygen, and photosynthetically available radiation. These two variables add another dimension to the oceanographic buoy. Accurate measurements will allow USGS scientists to calculate the key characteristics of the CO2-carbonate system and make inferences about coastal and ocean acidification, a big concern in our changing oceans. Members of the Ocean Circulation Lab (OCL) secured surface meteorological sensors and the satellite telemetry system. Later, the wind instruments would be removed from the older buoy already on site, and those instruments would be added to the new buoy to continue the valuable wind measurements that are necessary for producing reliable models of physical oceanographic characteristics. The next task required some heavy lifting…or dragging, more precisely. A couple thousand pounds of 2-inch thick chain needed to be cleanly arranged on the back deck of the Weatherbird so that the buoy could be dropped onto location when the time came. Volunteers on board helped Jay Law, the OCL mooring technician and chief scientist for the cruise, drag sections of the enormous chain using long, metal hooks. Working together, they created neat rows of equal-length chain, loosely tying the top link of each row to a cable crossing the deck. This method allows for a more orderly transition of the chain into the water. One last task had to be completed before everyone (except the on-duty crew) could turn in for the night: in rough seas, Law boarded the old C12 buoy from the side of the Weatherbird. He removed the wind sensors, killed the power, and rigged the lifting straps so the buoy could be recovered the following day. All of this work makes for a late night before an early morning. Time is precious –and expensive –on these cruises, so every minute needs to be accounted for and filled with tasks that can only be accomplished once out at sea. At dawn, final preparations to deploy the new C12 buoy began. After checking the chains, cabling, and instrumentation, the new buoy was hoisted by winch and lowered into the water. The buoy began drifting from the boat, and when the slack of the cable was tightened, a chain reaction (no pun intended) began among the rows of chain fastened to the anchor waiting on deck. With a tremendous rush of clanking, the chain fed out and with the last link, the enormous anchor flung itself into the sea to settle upon the bottom. Law, along with Yates and Lemon from the USGS, boarded the buoy as it swirled and rocked at the side of the Weatherbird. Captain Baumeister put some distance between the boat and the buoy, and the crew of 3 installed the wind sensors. When the USGS researchers returned to the Weatherbird, water sampling began. A rosette (a carousel of water sampling containers that can be remotely closed at specific depths by an operator on board) was lowered over the starboard side of the vessel, and when the rosette was brought on board, a swarm of scientists and volunteers poured small samples from the large containers to be used for analysis of red tide as well as for the carbon system properties. Dr. Kimberly Yates of the USGS samples filtered seawater for immediate analysis of pH in the ships laboratory. Luis Sorinas Morales, a doctoral student of physical oceanography, was tasked with collecting samples for Dr. Kate Hubbard of the Florida Fish & Wildlife Commission’s Fish and Wildlife Research Institute (FWC-FWRI), whose team of technicians and scientists would later examine them for red tide presence and concentrations. As researchers continued rounds of water sampling out on the deck, Randy Russell, lead engineer for the CMS Ocean Technology Group (COT), checked the satellite feed of the newly placed buoy from his laptop inside the ship’s laboratory space. Through telemetry, engineers and scientists back at CMS will be able to receive near-real time data from the buoy. COT engineer Chad Lembke handled the integration of the additional carbon system variables that would be transmitted alongside the previously configured physical variables in the data stream. Next up for Law and his group was to recover the old buoy, chain, wire and anchor. In reverse fashion, the buoy was acquired and raised onto the ship’s work deck, followed by the cable and a long, stepwise process of recovering the heavy chain and anchor. Once all gear, and personnel, was accounted for, the captain and 1st mate charted a return course for Bayboro Harbor, making note of the depths at which scientists had requested stops for water sampling. At regular depth intervals, the crew of the Weatherbird worked with the scientific party to lower and retrieve the rosette. Sampling the water column along a transect from shelf to shore is key to providing researchers a better understanding of the variation of carbon system properties as well as red tide concentrations, which they can then use to assess changes occurring across the west Florida shelf (WFS). As the deep blue of the outer shelf Gulf waters changed to green and eventually brown, scientists and assistants aboard the Weatherbird reflected on the success of the trip and shared stories of past projects – those that went as well as this mission and those that did not. Returning to port amid the darkness of the second evening, it was hard to believe that all of previous events had happened within the span of just 24 hours. A lot goes into the planning of each scientific cruise, and many hands are working, sometimes feverishly, to make use of the allotted ship time. Let’s also not forget that all of the hard work that happens during the cruise is a result of months or even years of hard work back on land – in the lab, on the computer, testing and formulating, checking and rechecking, and continually researching the literature for what works and what doesn’t.